Need some help I was doing insertion using toolbox on a shaft connected to a housing ,it doesn't really insert the right way or spec. for the shaft to housing . I attached the drawing because I need to add a shim or a bushing just to fit the bearing. Any ideas how I can insert the right specifications . I had this drawing also in Showcase. You can see there's a blue bushing. I think bearing housing must be machining to fit bearing. Can't use additional spacing between bearing and housing. Find right bearing for this application and machine housing to fit on it. You didn't get me I was using Solidworks 09 to insert the bearing using toolbox. So you saying I have to reduce the diameter of the housing or increase it just to fit in it? I was following a book on Engineering drawing and Design which were all right dimensions. 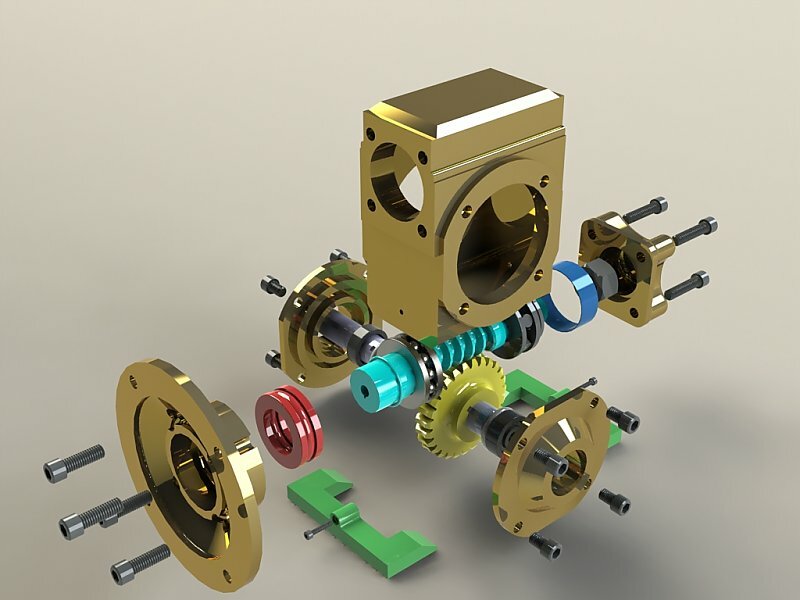 My problem was to insert it with Solidworks which automatically fit it with housing to shaft. It is very poor practice install bearing to the housing using spacer. Probability of slip is x times bigger because of four surface instead of two, spacer thickness - easier for thermal and mechanical deformation, part replacement cost (bearing + spacer). I know, sometime in real life you got no choice, but in design stage everything must be perfect. I don't know how it is by you : you fit bearing for shaft or shaft for bearing??? I'm not doing that drawing as work I'm just playing around ,just to submit here and to show as my sample drawings in SW ,I know it's not wise to put bushing 'cause bearing gonna slip. At the same time I did a mirror on the other side which the diameter is the same. Other side bearing fits in , while the other one doesn't due to different size of shafting on both end. Oh in reality that's right I was working with repairing engine there's is add on bushing as far as I remember.But your right about that not putting bushing . when you choose your bearing from the toolbox you have size options. There are also a number of suppliers listed in the tool box(skf for example). these suppliers profide 3d files for bearings in their proudct catalog. Example, Toolbox, Skf, Bearings, Ball Bearings, Radial Ball Bearing. From there you have hundreds of bearing choices listed by size(standard nomenclature for bearings) and Bore, thickness, OD are all listed. When i am designing a part like these(even for fun) i plan out things like bearings, shafts, thrust washer and bushing before i even draw any parts. Im sure with a little searching(if your housing is a standard size) you will be able to find a bearing that is correct. Are you not doing it by just inserting the bearing between housing and shaft, SW09 automatically adjust the size of the bearing. I did a lot of adjustment on the housing just to fit the bearing. Can 't find the right size . There is options to choose the right size that i encountered . Not sure if a standard that I did draw I'm just copying thru the books I read. Thanks for the advised. well like i said i pick my parts before the design(in most cases). I typically will find my part(which at least comes with a tech drawing or i have the part in hand), I will model it then insert it into my model. I dont let the software auto pick anything. From bearings, bushing, connectors etc. The problem with bearing calculator is user input. I would recommend you use the tool box, select a manufacturer and browse their bearings. These will give you a part number in most cases to reference and order the part. here is an example of how I would do it. mcmaster car is a supplier i buy parts from. I search for bearings, type roller, give my input for shaft diameter(because ive decided this already) and i have choices for other specs like width, OD, abec rating. When i narrow my choice down im given this. assuming the radial load, rpm specs are within my safety factor i will use those specs to model the bearing then use it in my design. Now with the toolbox i can go to Ansi Inch Ball Bearings and search for a model that meets my size(1in ID, 2in OD and 1/2in width). Most times you can find a model to match and wont have to model anything. Thanks for advised and suggestions , I gained more knowldge everday I go here. no problem. I may do it completely wrong but I know its much easier for me to find parts first(that i know i can get easily) and go from there. I have designed a few things that ended up with odd parts that were non standard things. When dealing with production volume components it may be worth it to have custom size bearings and things made so thats something to keep in mind if the design is truely driving the components. cani get the technical drawing of this product as i have one but it is very concise and clear.